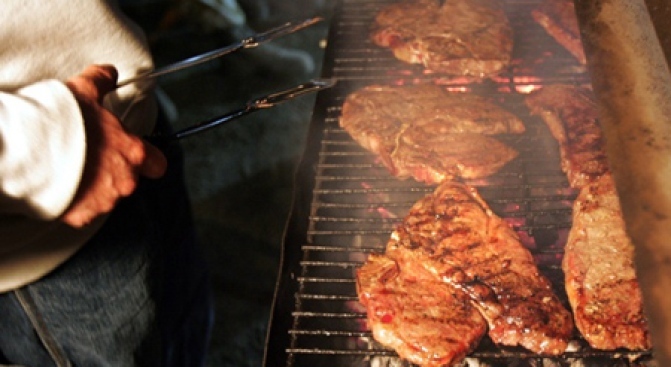 Get meaty at the Good Beer Month Local Grill-Off. DRIVE MY CHAR: For an event involving tongs, the Good Beer Month Local Grill-Off at Long Island City’s Water Taxi Beach is an elaborate affair: While more than 20 amateur cooks face off at the grill (starting with meat from sustainably and humanely-raised animals from regional farms), “pro” grilling stations will be manned by folks from meaty go-tos like Williamsburg’s Fette Sau. Meanwhile, Sixpoint Brewery will be sudsing the crowd, and proceeds will benefit Slow Food NYC. 6-9PM. BLOODY BRILLIANT: Like so many U.K. comedy exports before it – from ‘Monty Python’s Flying Circus’ to ‘Absolutely Fabulous’ – the BBC sketch show ‘The Mighty Boosh’ is a little skewed and a little dada, and toys with the boundaries of what’s funny (check out their ‘Jazz Trance’ sketch on YouTube). The series’ stars will be at Other Music signing copies of their new Season 3 DVD from 6-8PM. WILD HORSES: In 1969, what started as a fun free concert headlined by the Rolling Stones ended in blood, with one fatal stabbing and three other (accidental) deaths. Filmmakers Albert and David Maysles' (Grey Gardens) footage of the night at Altamont Speedway is an era-defining document. ‘Gimme Shelter’ screens at the Maysles Cinema, 7PM.